According to MLA Canada, a pre sale marketing firm in Vancouver, the Vancouver pre sale condo market has begun to cool. In April, just 43% of pre-sale condos offered in Metro Vancouver sold, compared to 94% in January, 83% in February and 63% in March, per Cameron McNeill, a partner at MLA Canada. The slowing absorption rate of pre sale condos comes at a rather interesting time. 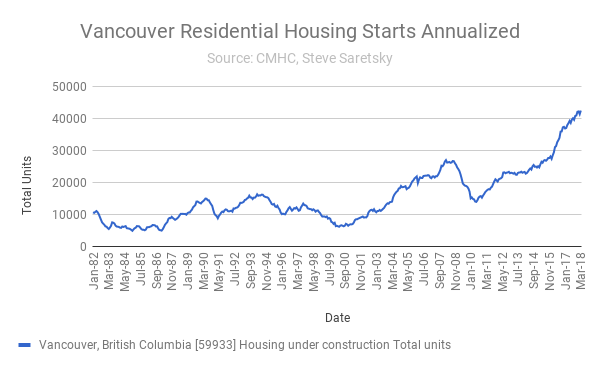 In April, resale condos in the city of Vancouver fell to a five year low, dropping 18% year over year. Despite condo sales slowing considerably in both the pre sale and the re sale market, a record number of new construction is set to roll out. The month of May is anticipated to be the busiest month of 2018 to date, with over 2,300 pre sale units expected to come to market, including seven new high-rise towers. It’s expected about 85% of total units for sale will be condos. The construction boom across Greater Vancouver is firing on all cylinders. Housing starts, housing under construction, and housing completions are all record highs. As of March 2018 housing starts ticked up to a new high with an annualized pace 42,590, ensuring a flood of new supply is in the pipeline for years to come.